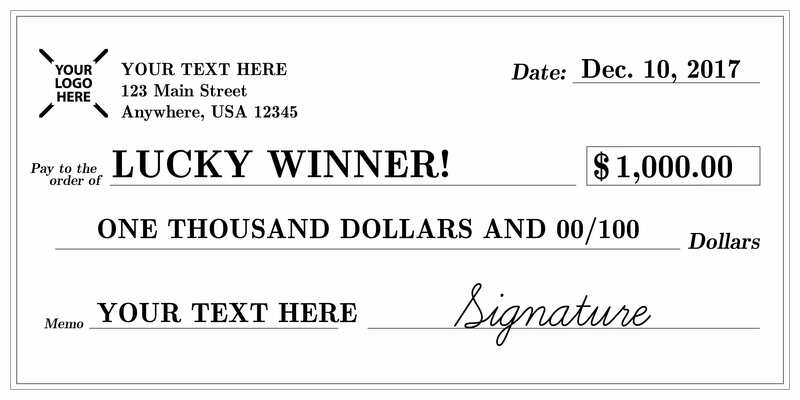 We know you’ve seen a giant check at some point in your life, whether at a charity event, public donation, or on a Publishers Clearing House giveaway. There are countless ways to utilize an oversized check, so we’ve put together a list of 10 common (and some uncommon) ways to maximize their functionality. Giant checks are made from a lightweight foam board, making transporting and handling them easy without breaking your bank or back (but handle them with care, because the material itself can break or bend and cause permanent creases when not handled correctly). 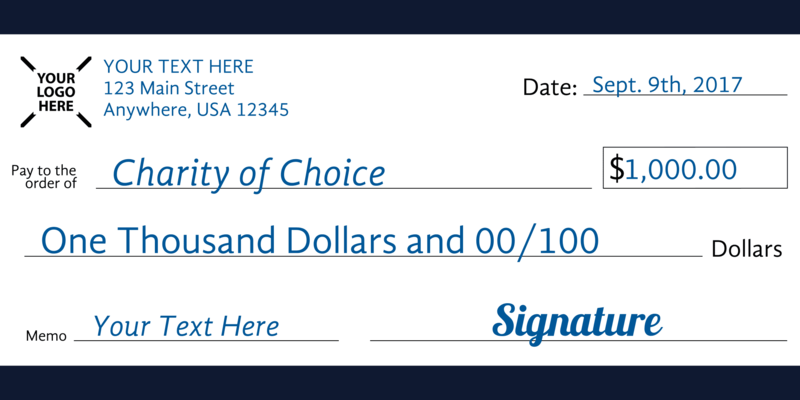 Even though these checks aren’t made with a dry-erase surface, they are completely customizable and our team of professional graphic designers are happy to help you customize the check to your liking for free! With the basics covered, let’s jump into those 10 common uses of large checks. Fundraisers – Is there a better way to present the earnings of a fundraiser than with a custom giant check? Not only are they great for presenting, but they can be easily displayed on a wall for the long term to remember the momentous accomplishment! 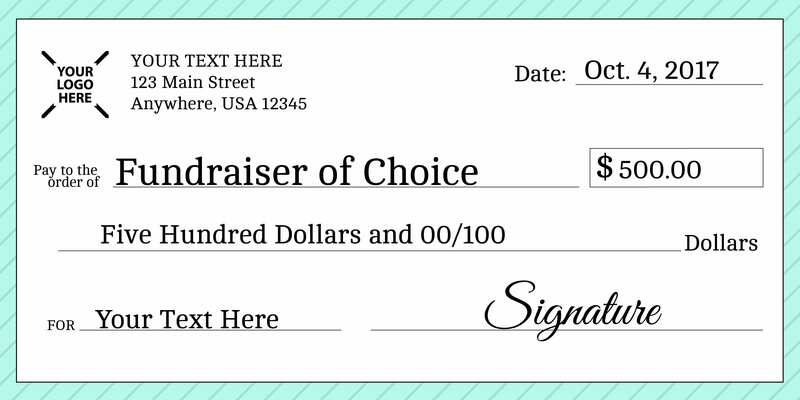 Click template to customize your fundraiser check. Sponsorship Deals – Sponsoring a local event? Or maybe you’re sponsoring a local athlete that’s traveling around competing; whatever it may be, a giant check is a great way to show your support and loyalty to the cause you’re donating to. This is a great way for small local businesses to develop relationships within their own community! 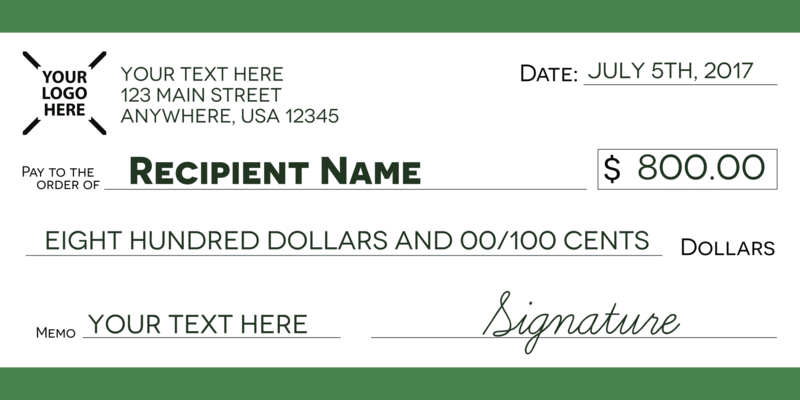 Click template to customize your sponsorship check. Scholarships – Besides a congratulatory letter sent to the winner of a scholarship, include an on-campus ceremony with the presentation of a giant check to commemorate the award. Snap a picture with the giant check and make it shareable on your social media accounts for further engagement and publicity. Click template to customize your scholarship check. Airline Tickets – Whether for an airline giveaway or a customer wanting to surprise a family member or friend with an island getaway, giant checks can be repurposed as giant tickets as a creative way to gift someone tickets for that trip they’ve always wanted to take. Click template to customize your giant airline ticket. 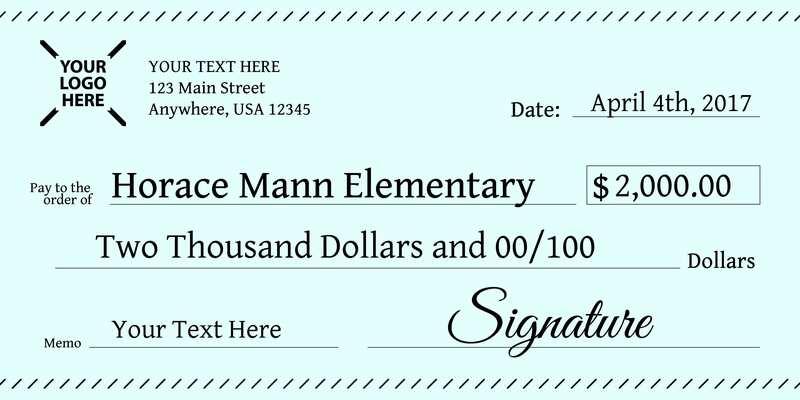 Academic Donations – If your business is making a donation to a school or college, consider doing so using a giant check. 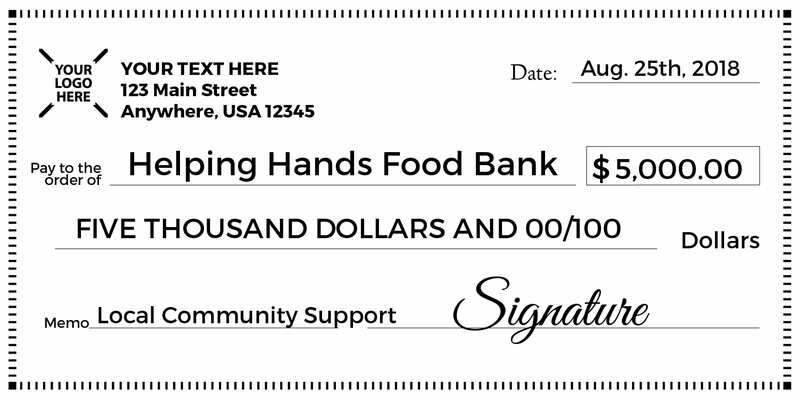 With a little work in advance this donation with a giant check could be an easy way for your business to get local media to cover the official ceremony or the event that you make into one that can be publicized! 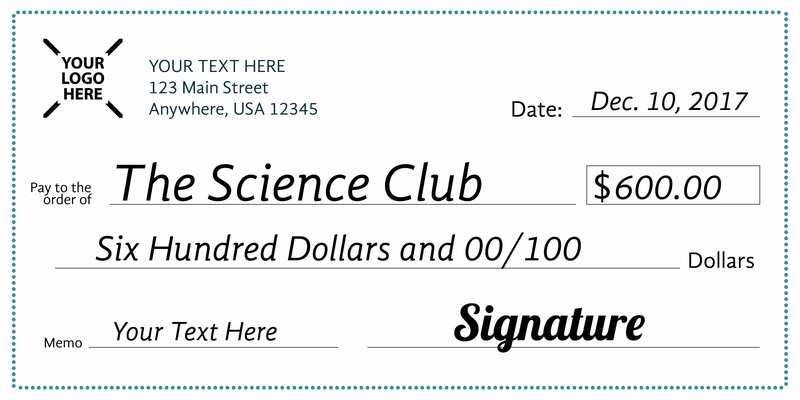 Click template to customize your giant academic donation check. Ground Breakings / Grand Openings – Whether you’re breaking ground on a new project or you’re ready to cut the ribbon to open your doors consider having a giant check presentation to add to the day’s events. Checks can be presented to the community, to new employees, or a lucky customer that won a giveaway and make for journalist-friendly photo ops for any media covering your ground breaking. Private donors can also use these events to donate to public buildings like libraries, schools, or hospitals if they are not doing so anonymously. 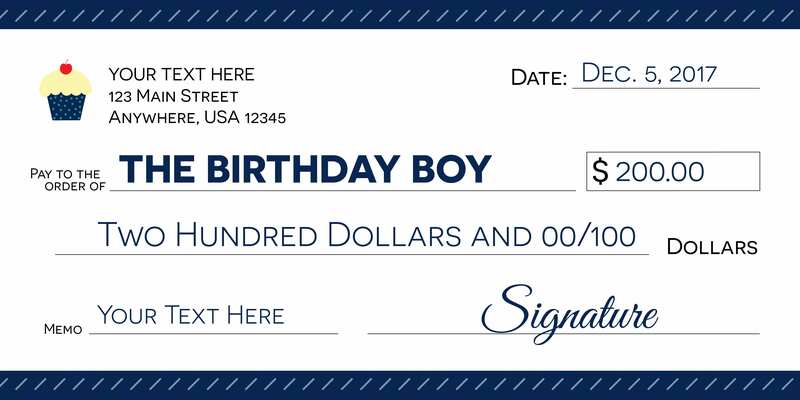 Click template to customize your giant check. Sporting Events – Enhance your halftime or intermission festivities by using giant checks to present award money to fans participating in competition or raffles. 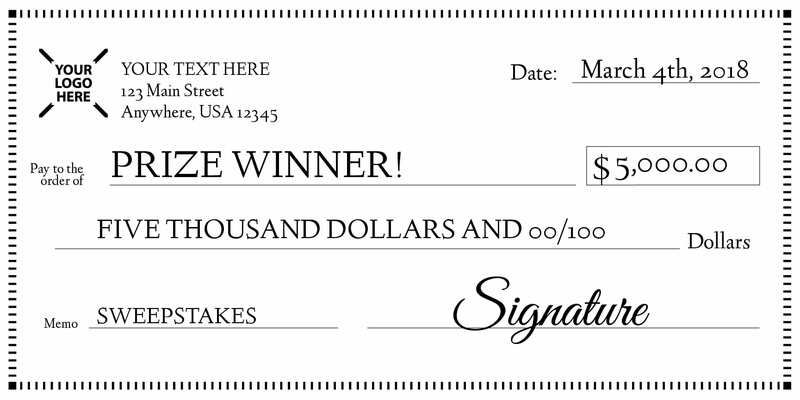 If you’re giving away a cash prize to the winner of a sport competition, do so with a giant check! Sweepstakes – One lucky winner will receive a brand new car and a $100,000! Why not present that prize money with a giant check so the winner can remember their winnings for years to come! Click template to customize your sweepstakes check. Charities – The ceremonial handing-over of a giant check at a charity event is something that will never go out of style. The check itself represents the hard work of donors and volunteers towards the charitable cause, which can be displayed proudly by the charity for years to come. 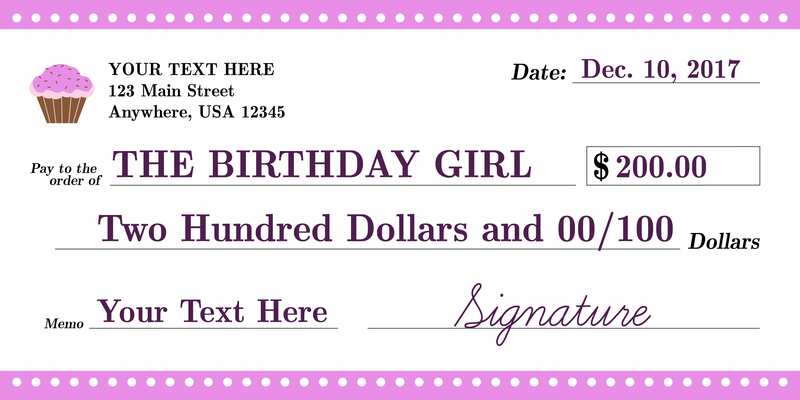 Birthday / Anniversary gifts – No one is going to suspect receiving a giant check for a present! Instead of paper vouchers for a day at a spa, think of how impactful a giant voucher (using a giant check) would be! Checks can be customized to display whatever you want, including vouchers, coupons, plane tickets, sporting event tickets, and more! As you can see, there’s plenty of uses for giant checks! It’s really up to you and your creativity in how you use them. Need help designing the perfect check for you? We offer free design services that can help you out. From small gatherings, to a novelty gift, to important official ceremonies, giant checks and Signs.com are there for you.